When you lack sufficient arches in your feet, you may have a condition known as flat feet that can make it difficult to walk or run without pain. 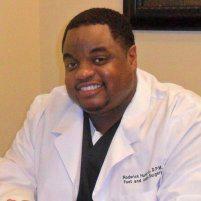 At his Plano, Texas, podiatry practice, Roderick Hunter Jr., DPM, AACFAS, is experienced in diagnosing flat feet and offers a variety of treatment options to improve your comfort, including custom orthotics and anti-inflammatory medications. Avoid additional complications caused by flat feet by scheduling a consultation with Dr. Hunter online or by phone today. Flat feet, also known as fallen arches, results when the arch of your foot isn’t normal when you’re standing up. This abnormal arch may cause you pain when you’re involved in physical activities such as running or jumping, or when you stand for a long period of time. Infants often have the condition, which usually resolves on its own by age 3 as the tendons and ligaments begin to tighten up in their feet and legs. However, some people continue to have flat feet into adulthood, which can increase the risk of chronic foot pain and future injuries. Flexible flatfoot is the most common form of flat feet and occurs when your foot arch only appears when you lift your foot up off the ground. Flexible flatfoot rarely causes pain or mobility issues. Flatfoot may also be the result of a short Achilles tendon, which connects your calf muscle to your heel bone. Additionally, injuries to the tendons that connect your calf muscle to the inside of your ankle can result in a lack of sufficient arch support. What are my risk factors for flat feet? You may be at increased risk for flat feet if you have a family member with the condition. Flat feet is also more common in athletic people who suffer foot and ankle injuries. Age and underlying medical conditions, such as high blood pressure, diabetes, and obesity can also increase your risk of developing flat feet. What treatment options are available for flat feet? Initially, Dr. Hunter may recommend footwear or custom orthotics to provide your feet with sufficient arch support. You also need to make changes to your lifestyle, such as adopting a healthy diet and exercise program to help you maintain a healthy weight. Additionally, you might need to limit activities that require long periods of walking or standing. If flat feet cause pain or inflammation in your feet or ankles, Dr. Hunter may prescribe medications to keep you comfortable. When flat feet cause severe, chronic pain, Dr. Hunter may recommend surgery to create an arch in your foot or repair torn tendons. If you have a short Achilles tendon, Dr. Hunter can also perform surgery to lengthen the tendon and improve your functionality. 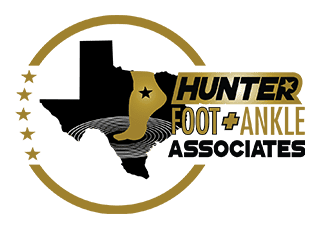 Schedule a consultation for flat feet with Dr. Hunter using the online booking feature or by calling his Plano office directly today.